As business and ordinary Zimbabweans alike begin to feel anxious over the current political stalemate, yesterday churches waded into the mix by challenging opposition leader Nelson Chamisa to “accept the will of the people” and move on. 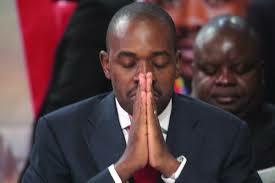 Chamisa is contesting President-elect Emerson Mnangagwa July 30, victory which he alleges was achieved through ballot cheating and tampering. On Friday, the youthful MDC Alliance leader filed papers at the Constitutional Court seeking to overturn Mnangagwa’s result. Addressing journalists in Harare yesterday, the Zimbabwe Amalgamated Churches Council (Zacc) warned that the stalemate was hurting business recovery and as such, Chamisa needed to “put the country first”. “As the Church in Zimbabwe, representing apostolic sects in the land, we prayed for peace and we observed that the elections were held in a free and fair environment. “Our members voted and it was heart-warming to see people from diverse political backgrounds embracing and voting in peace and harmony. “However, we are now surprised that Chamisa, who claims to be a pastor wants to foment chaos and suffering among Zimbabweans. It is trite that Zimbabweans are peace loving and God fearing people and do not want to be abused by political leaders who are more concerned with attaining their selfish goals,” Zacc patron Jimayi Muduvuri told the media. Muduvuri who, was Zanu PF’s candidate in the senatorial elections on July 30, said Zacc was perturbed by acts of violence which led to loss of life and damage to property on August 1, when MDC Alliance supporters clashed with security agents. Six people subsequently died when the army, which had apparently been called in to assist in managing the situation, used live ammunition to break the ugly protests. “We strongly condemn the MDC Alliance stance to ignore the people’s will and pray that sense prevails among their supporters who just recently went on a rampage, looting shops and disturbing our peace. “Leaders of the church would like to tell all politicians that the country’s president was ordained by God. He was chosen by God and the will of God should be respected. “When people play in any game some win and some lose but to our surprise someone saw that he was losing and started causing chaos. As Christians we are calling for a thorough investigation because innocent lives were lost rather needlessly,” said Muduvuri.